All of us, at some point in life, were stuck indoors on a beautiful day, and wished we could be outside. As kids, we’ve daydreamed about our teacher conducting class outside. As adults, we’ve joked with a co-worker about moving a desk outside on a nice afternoon, longing to escape the confines of a stuffy, drab office. When many might consider an outdoor classroom as a lofty dream, Shakopee High School turned the dream into reality. Shakopee High School had a vision to offer environmental education in a sustainable, outdoor classroom setting that could be used throughout the entire year. They decided to design and create the Shakopee Environmental Learning Center, which is located on the grounds of Shakopee High School. Initially, the idea began when former Principal Jim Murphy and master gardener Judi Tomczik, with additional input from a few teachers, wrote a grant seeking initial funding for the building project, which included a learning center building, and later a wind turbine, solar panels, and surrounding landscaping. Once the initial grant was secured, the project quickly blossomed into the procurement of additional grants and funding, paving the way for further expansion of goals and possibilities. Contributions came in the form of financial, volunteer, and educational support. The building itself was built by the hands of over 40 students, with guidance from contractors, who not only donated their time and expertise but also materials for the project. Additional building efforts were contributed by volunteers as well. Paul Nettesheim and Judi Tomczik called this a “community based project”, citing the collaborative efforts by local businesses, organizations and community members that have interacted with the students and staff of Shakopee High School to complete the project. 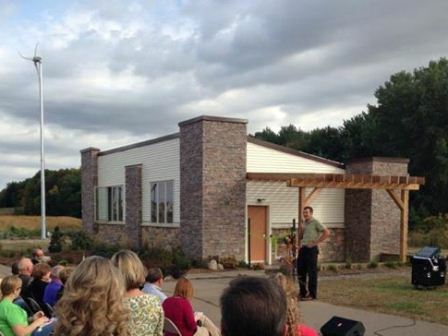 “The Shakopee Environmental Learning Center (SELC) is a model of community interaction and involvement. This project ties together efforts from Shakopee High School (SHS), local building contractors, the City of Shakopee, and Lowe’s Home Improvement to create an innovative, self-sustaining structure that will serve as a model of green design and clean energy sources for this region” according to Nettesheim. Metro CERT awarded a seed grant of $4,000 to fund professional expertise and technical assistance to conduct the installation of the wind turbine and solar panels. Total costs of the project exceeded $200,000, and included grants, monetary donations, donated materials, and donated labor. Most of the work involved in the initial project has been completed but Nettesheim explained that, “Students have worked with local contractors and organizations to continue to enhance and upgrade the program”. The site is utilized by a diverse body of the student population, including environmental ethics, biology, and art classes. Building construction students were also an integral force in the actual construction of the building. Additionally, students of the Environmental Ethics class have hosted fourth-graders in the district on field trips to the site, engaging the younger students in hands on environmental learning. Over the past two years, more than 400 fourth-graders have visited the site to learn about and interact with the outdoors. Tomczik explained that the Shakopee Environmental Learning Center helps the fourth graders on a field trip in, “getting connected with the environment while the high school students get connected with the community”. The project has had phenomenal results. Not only can the site meet its own energy demands, it actually produced more than it consumed from May to December 2012, resulting in a credit of $348. The Board of Shakopee Public Utilities learned about the project and opted to sponsor the renewable wind and solar energy generation of the building. 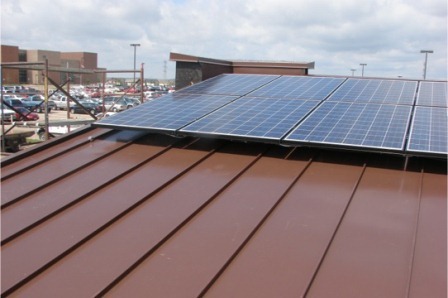 Once the building was constructed and the solar panels and wind turbine were in place, the Minnesota Municipal Utilities Association won a grant from the MN Division of Energy Resources to implement an onsite energy storage element. John Crooks, Utilities Manager at Shakopee Public Utilities explained that, “This allows energy generated from the PV solar panels and the wind turbine to be stored at the site and used, for example, when it would be a calm/cloudy day”. The calculation of actual energy is a Net Meter, which tracks both production and usage as well as allowing two-way flow of electricity input and output to and from the electric grid. John Crooks explained, “If the production, called distributive generation, is more than the usage, there is a credit to the customer. If the usage is more than the production, there would then be a charge to the customers representing the difference between production and usage”. Some spin-offs resulting from the project include an Environmental Ethics Share Night, where students can showcase work they are producing. A couple of environmental student clubs have also started up as a result of this project. Currently, plans for expansion of the landscaping and gardens are underway. Local and cultural context has been taken into consideration when formulating design ideas. As an example, Tomczik explained that a Medicine Wheel Garden will be an important element to the landscaping that relates to the area because “[The] Tribal council is within boundaries of the school district, and this garden honors local history”. As for the future of the project, Nettesheim envisions continual evolvement. “The project will continue to evolve through the years to come. The committee believes that it will only grow and more individuals and corporations will become involved and want to help the students of Shakopee High School”. Currently, plans to add additional solar panels are in the mix. A proposed biology summer school class is also in the works. Additionally, a dashboard function will become available. It will act as a tracking component of the building’s energy usage, and will soon be available for students, as well as parents and community members. The goal is to make the dashboard available on a website, where anyone can see what benefits can be had through renewable energy by viewing the energy statistics of the project, to include energy site production and consumption, any energy that is stored in the storage unit, as well as energy that is fed back into the electric grid.